The great thing about a homemade barbecue grill is that you can make one out of just about anything and it needn't cost the Earth either. 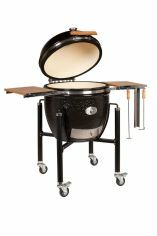 We now make a range of stainless steel charcoal grills and smokers but at the risk of indulgence, let me explain how it all began. I built my first homemade bbq grill out of a pile of bricks and a cake cooling tray and it worked perfectly well for what I needed at the time. 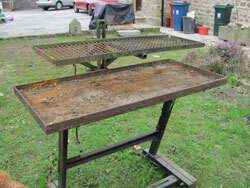 My next homemade grill (in the piccie below) started life as an industrial sewing machine stand. 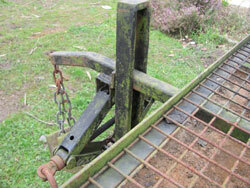 ...is an old sewing machine stand. It doesn’t have to be this but I found this stand to be ideal because it is just about the right height for me and provides a reasonable size cross section for a good surface are of grill. 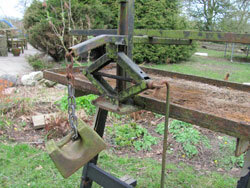 Is a rectangle of cast iron that I got my local blacksmith to weld a lip to so that my bricks didn’t fall off the tray. I used 3mm thick sheet. What dimensions for the tray? That depends on the dimensions of the bricks that you are using and how big a cooking area you want. Because of the dimensions I chose, the fixing bolts are directly underneath the bricks and this makes some of the bricks wobble. It's nothing serious, just annoying. Plan it our with the bricks placed on a sheet of paper and you'll avoid making the same mistake that I did. To give me flexibility ie. I can move then around to create a small ring if I only want a little fire and take them all off the "table top" to make for easy disposal of the ashes. This is the complicated bit from a metal work point of view so I was straight down to my blacksmith but it’s basically a rectangle made out of steel angle welded to a piece of tube that is subsequently welded to the height adjustment mechanism. The dimensions of the rectangle doesn’t need to be quite is large as the grill tray but certainly so that it overlaps the bricks. The cooking grid is steel mesh cut to size. After all it is a homemade BBQ grill so what did you expect, stainless steel? Steel is a little crude and takes a lot of work with a steel brush to keep clean...and that's why I now make stainless steel cooking grates. For a temporary fix, the cheapest and easiest solution is to slap a Teflon barbecue mat on top of the steel grate. The final part of my homemade barbecue grill is the height adjustment and congratulations if you’ve spotted that it is an automobile jack. If properly greased, this is a really easy way to get absolute control of the charcoal heat. Note that I have a counterbalance to ensure that the cooking rack drops down when the jack is compacted. The final design of my homemade barbecue grill is quite heavy so I put it on casters but sadly they were not good quality. 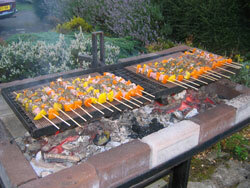 It's worth spending that little bit more to get some decent casters so that you can move your grill with ease.